I usually don't have to wear a suit to work. Infact, it's pretty laid back that I can wear a tee and denim to work on a Monday. However, because of my core advertising Account Management background, Mondays and Tuesdays are sacred, smart dressing days for me regardless of anything. Black is a very forgiving colour and because of my pear shaped figure, I like to hide behind it. Besides, black can be worn all year round regardless of the weather. I've never owned a jumpsuit before but I love this one because of it's loose fitting style but the waist is cinched thus ensuring that my figure remains intact. The lightweight sweater can be worn over the jumpsuit with sleeves pushed to the elbows for a laid back, formal feel. This will also help to ward off any unsavoury chill in the office which can come either from a forgotten open door or window. Not being a fan of heels, I have found that wedges are perfect for me and enable me to walk comfortably all day long regardless of the distance while not letting the weather dry out my feet. These pair are perfect and the ankle buckle ensures that it stays in place on my feet. Ever since I decided to stop fighting my unconscious love for gold accessorises after realising that it perfectly suited my warm undertones, we have developed a very complimentary relationship. Give me a handbag that can take everything anyday and I will love you forever. A neck scarf is an essential commodity and I am never caught dead without one around my person. Pull the entire outfit together with a great coat which is just for walking from the car into the office and you'll definitely get a lot of oohhss and aahhhss when it comes off. I love denim, I really do, but for some weird reason, regular pants have a stronger appeal for me. Basic pants and a loose top are a staple on casual days. What wrong can a winged liner and matte red lip ever do? A slouchy hand bag and charm bracelet to finish the look. Lace-up shoes, I love lace-ups. I can wear anything lace-up so of course my fall choices will be booties for casual days. Fall nights remind me a lot of going out in Harmattan here in December. Regardless of how much we hate the dust, we are still so thankful that the weather is a bit chilly rather than the heat we experience the rest of the year. This is the best time of the year to be utterly and comfortably stylish because you are very certain that there won't be a sudden downpour to drench your outfit or so much heat your makeup is in danger of melting away. Having come to the realisation of the fact that the easiest way to look like a girl and feel flirty is with a lovely vintage skirt and easy blouse, this tropic skirt and blouse with lace detail is definitely a must for me. Simple, statement accessories are my favourite and that's where this peacock pair of earrings and twisting tree necklace come in. Never mind the gold watch. Do I really need to say why I'd rather carry a postcard clutch than a solid colour clutch? I think not. A little sparkle is needed and the Betsy Johnson heels steal the show. It's a bit chilly, so we'll wrap it all in this military style coat which is the most flattering army green shade, on me that is. So there is what I would wear in a pinch if there was Autumn here, lol. Still it's a season I love especially because of the dominant colours that compliment. So I just might be wearing some of these in the harmattan. 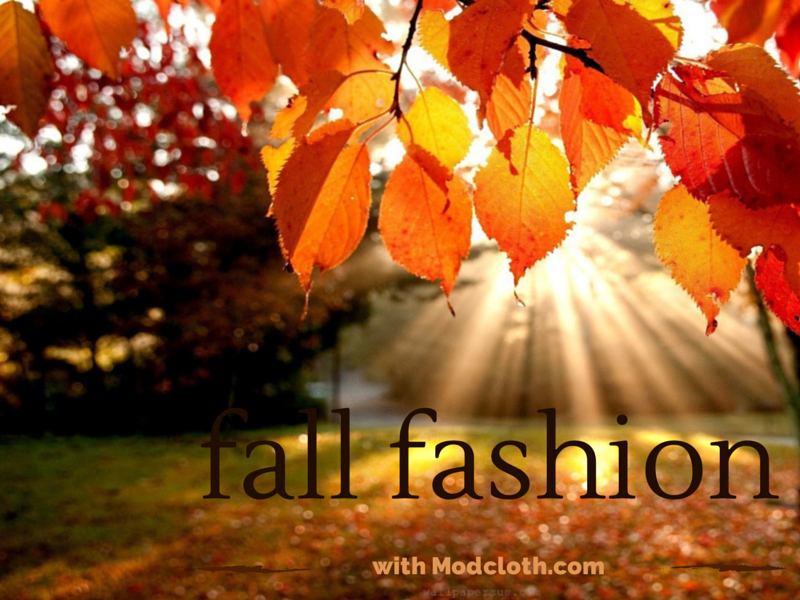 If you want just a sprinkling of autumn without going all out fall fashion, then just try out one of these sweaters from Modcloth's lovely sweater collection. Oh, did I mention they'd also make great Christmas gifts? That's a good idea right?